I'm in a balcony overlooking the heaving sea, one rainy day; the breeze is forcing the trees to bend over in obeisance to the monsoon and the sea responds with booming gun-salutes as waves crash over the shore. Yours truly is seated on the floor, with the breeze sending a few stray drops her way. Writing about Bhadra, in Karnataka, is proving to be more difficult than I thought - how do you describe a place that defies typical descriptions? In a way, the experience there too is about the water and the trees, like the scene playing out before me right now. Yet, it is a whole world away. Picture what you know about these: reservoirs, islands, rooms with views, bridges, forests, birds and animals. You can expect all this at Bhadra, but not quite in the way you know it. 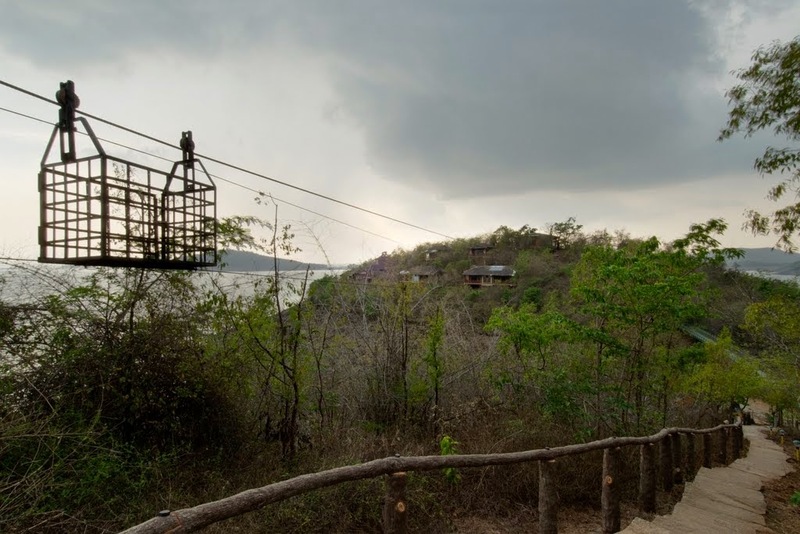 From the highway, as you drive towards the government-owned River Tern Lodge, the only accommodation at Bhadra, the panorama may seem insipid. 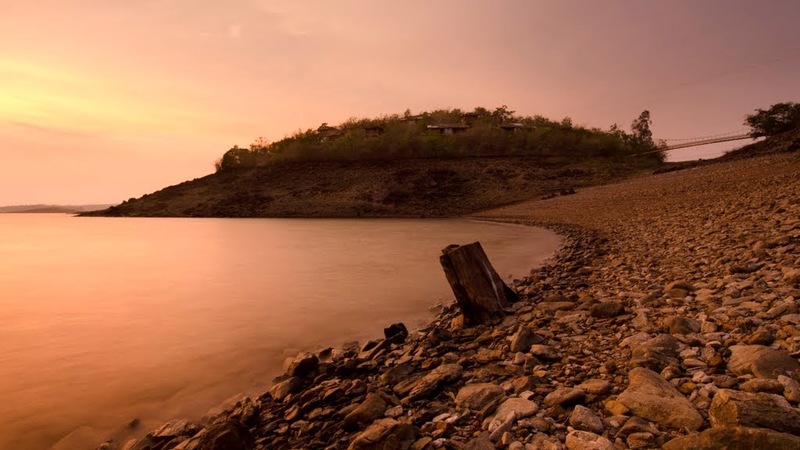 But, to experience Bhadra is like unravelling a gift wrapped in many layers - it progressively makes you fall for it. You walk through the entrance, past the reception, along a path and down a long flight of steps. This is where you will take the first of many pauses. Before you appears the beginnings of a suspension bridge; your pace quickens. Soon, you will pause again; you realise that the bridge leads to an island and both are tantalisingly surrounded by water. You trot across the bridge, only to pause yet again, to realise that you are actually in the middle of the reservoir. By the time you climb up to your room and go to its balcony, the scale of the reservoir dawns upon you. This is where you will pause the longest, before reluctantly returning to your room. The suspension bridge connecting the island to the mainland is a gateway to solitude. The cottages on the island may be a long walk away, but, staying there makes you feel like you are the lone resident of the island. I might sound presumptuous in pointing out exactly where you will pause. Also, I confidently say 'will' pause and not 'may' pause, only because no matter how many times you go to Bhadra, you will stop and look. By the time you've spent the day lounging on the balcony, napped in the afternoon looking at the reservoir and sat ensconced under a starry night sky, you are a convert. 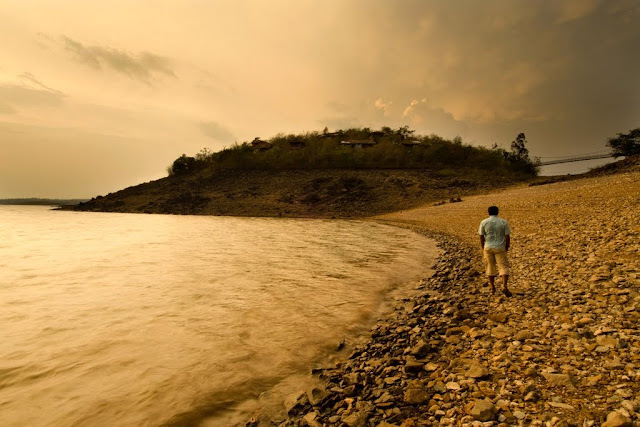 You will definitely be drawn to Bhadra again and each time you visit, you will be shown something new. 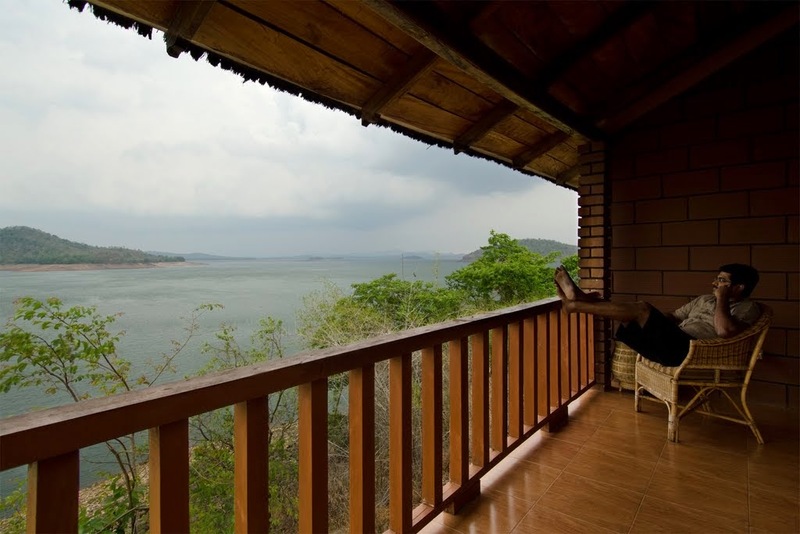 The balconies at Bhadra command panoramic views of the reservoir and are some of the most soothing spaces to lounge in. This is how I slowly discovered that in some cottages, you can bathe in the company of birds outside your window. In yet others, Red Spurfowl stand in front of the window pane, admiring their reflection or mistaking it for a threat. Some seasons, the reservoir is calm, as all reservoirs should be. At other times, you can constantly hear waves lap against the shore. I discovered how evenings can cloak everything in myriad hues. And, how you can be right in the midst of this giant paint-brush by walking down to the reservoir's edge. I also learnt how strong the currents in the deceptively gentle-looking reservoir can be. And, how it can sometimes rock the boat enough to drench you during a safari. Sunsets by the reservoir display an ever-changing colour palette. The reservoir’s edge is a soothing place for uninterrupted conversation with somebody. Or, for conversations with your inner-self. 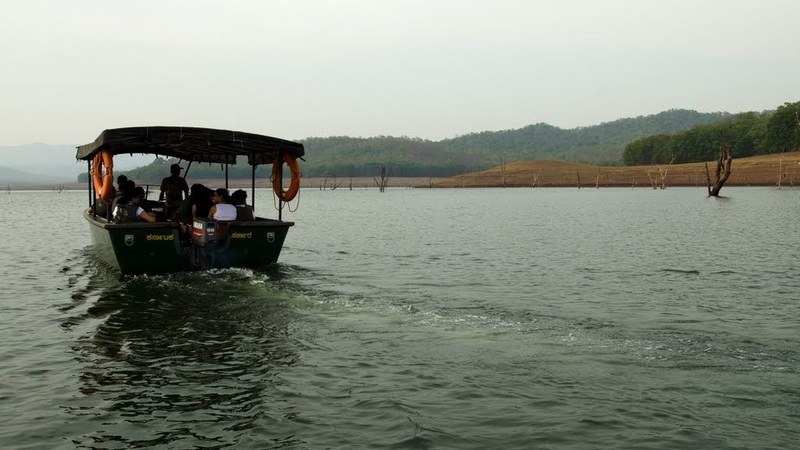 My favourite way to experience Bhadra is through the water and all the life it supports. Boat safaris along the forest edge and around the islands reveal a huge diversity of bird and mammal life. Unique to Bhadra is the congregation of thousands of River Terns on some islands, during their breeding and nesting season from March to May. Raucous, belligerent and fiercely protective of their food and territory, terns can keep you entertained with their antics for hours on end. Especially hilarious is to see them seemingly wash the fish they catch before eating it. 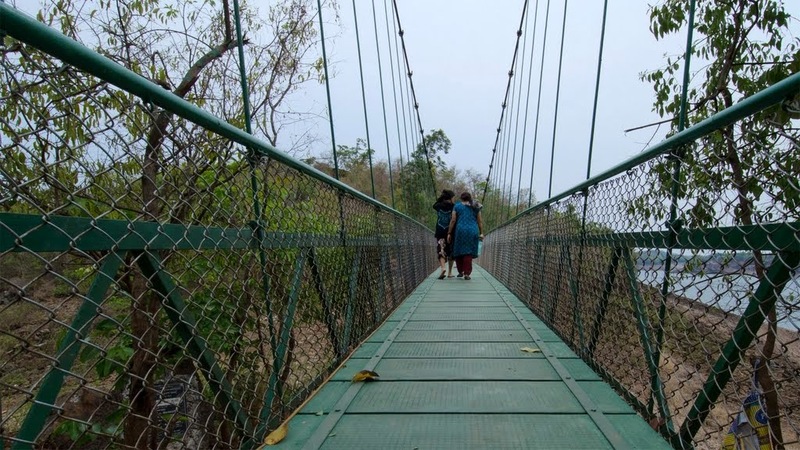 Jeep safaris through the predominantly Hunal forest offer an experience quite different from the boat safaris. In winter, these Hunal trees lend a deep-red patina to the otherwise green forest. The chance to spot the melanistic leopard, more famously known as the 'Black Panther', often keeps guests at the edge of their seat. A boat safari along the fringes of the forest offers a chance to sight many of the birds and mammals which call Bhadra home. Hyperactive terns against a backdrop of the dam and the reservoir, at sunrise. At the end of the day, after you return from the safaris, it's time for quiet contemplation. With very few lights lit, your auditory senses are heightened. 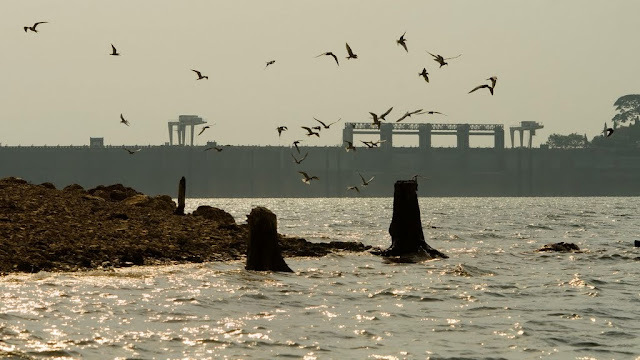 You can now hear all that you saw - the crunching of the leaves as you make your way along the path, a rustle as something darts across, the creak of the bridge as you cross it, the howl of the wind which rocks the bridge, the lapping of waves at the shore, the relentless drone of Cicadas, and, a voice in your head telling you how Bhadra feels like it belongs to you. And, how you effortlessly feel like you belong to Bhadra. With this thought, you will end your day where I began - in a balcony. Only this time, at Bhadra. This place seems so inviting. I swear -- a nice quiet holiday in a place like this is just what I need now. Lovely images, Raji. Thanks :). Yes, it's a JLR property. No, Kerala was not a typo; I was writing this story while holidaying in Kerala :). Which is why I've said that though both places are about water, they are so different from each other. But, thanks for pointing it out. I now realise that it is not very obvious. Will make a change to highlight that. Thank you, Arthur. Very generous of you to say that! Excellent post Raji. Vividly and elegantly captures the River Tern Lodge experience. Great to read a well-written piece about what is undoubtedly one of JLR's most special locations. Thanks, Badri. Bhadra is special indeed! Very interesting ! Wish more travel, more clicks, more writings !